When the monoclonal Ig is IgG, IgA or consists only of light chains, its origin is investigated by looking for an abnormal plasma cell population in the bone marrow. The demonstration of such cells establishes the diagnosis of myeloma. This diagnosis is based on a bone marrow differential count, analysing the percentage of plasma cells and the presence or absence of any abnormalities in these cells, particularly nuclear abnormalities. 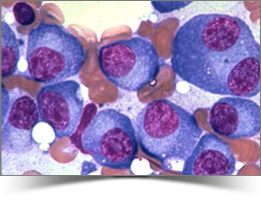 Myeloma is almost certain if more than 10% of the cells are plasma cells, especially if they are of abnormal appearance. Demonstration of the complications of clonal proliferation supports the diagnosis and is a factor in the decision to treat. An excess of plasma cells in the bone marrow can result in bone marrow failure, the most common manifestation of which is anaemia. The abnormal plasma cells also secrete cytokines, which activate osteoclasts and affect the balance between bone formation and bone destruction. Bone loss results, which may be generalized and/or predominate around foci of plasma cells, resulting in demineralization with or without the presence of « punched-out » osteolytic lesions. This myeloma bone disease frequently causes pain, often due to fractures (vertebral compression) and sometimes hypercalcaemia. The extraosseous extension of plasmacytomas can cause compressive symptoms, particularly spinal cord compression, generally due to extension from a vertebral site. 1) Myeloma is present and is causing clinical, biological (anaemia, hypercalcaemia) or radiological symptoms. Treatment must be considered. 2) In other cases, myeloma is present (indisputable presence of abnormal plasma cells on the bone marrow smear) but the patient has no symptoms and no suspicious lesions are seen on skeletal radiographs. Most of these cases of asymptomatic myeloma, also referred to as smouldering or indolent myeloma, develop slowly and only require monitoring. Some might warrant treatment, mainly if magnetic resonance imaging (MRI) of the spine reveals anomalies that are not visible by standard radiography. 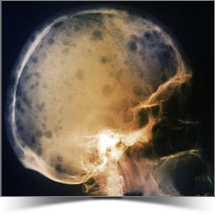 3) The third situation is monoclonal gammopathy of undetermined significance or MGUS: the bone marrow smear shows neither an excessive plasma cell count nor abnormal morphology, the full blood count is normal and no suspicious lesions are seen on skeletal radiography (or MRI of the spine, if performed). In most cases, a low level of monoclonal Ig is found (less than 20 g/L for IgG and less than 10 g/L for IgA), urinary excretion of free light chains does not exceed 300 mg/day and polyclonal Ig levels are unaffected or only slightly reduced. Many other parameters for distinguishing between MGUS and early myeloma have been considered. The investigations are all difficult to perform and interpret and none have yet been validated. Furthermore, the same plasma cell abnormalities that characterize myeloma can be detected in MGUS using modern molecular techniques. Thus, certain translocations that bring a precise region of the Ig genes (located on chromosome 14) into proximity with various oncogenes (e.g. cyclin D1 on chromosome 11 or FGFR3 on chromosome 4) are also found in MGUS. These findings mean that most (or perhaps all) MGUS should be considered premalignancies rather than truly benign conditions. Thus, when an apparently « benign » monoclonal Ig is detected, there are currently no criteria that can be used to evaluate with any certainty the risk of progression to myeloma. Such conclusions may only be drawn on the basis of data on its progression, and long-term monitoring is therefore warranted.